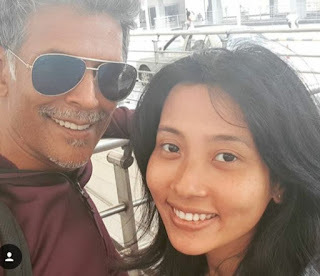 The Captain Vyom actor and Ironman triathlon Winner At the age of 50.Can You Guess …Correct Mr. Sexiest Milind Soman and Ankita Konwar Celebrated there 4th Anniversary at Airport and you can see there pics below. Milind Soman Share Pic on his Instagram and he wrotes “4th anniversary! #AirportRomance.”Ankita also posted romantic picture of this cute and hot couple on instagram and she wrote “You, a gift from the stars, thankful every day, for the way you make me feel! You inspire me to be the best I can be. You broke down those walls of worries I built around myself and taught me love, trust and faith! Thank you for being there each time I did not even know I needed someone! Like a magician you knew exactly how to turn my tears into a wide smile, every single time! My best friend, my love, my strength, let’s stay us, forever is now” and also She has tagged Milind Soman in her Instagram pic. Milind Soman did films like ’16 December’, ‘Rules: Pyaar Ka Superhit Formula’, ‘Say Salaam India’ and ‘Bajirao Mastani’. Apart from this he co-judged show like ‘India’s Next Top Model’.